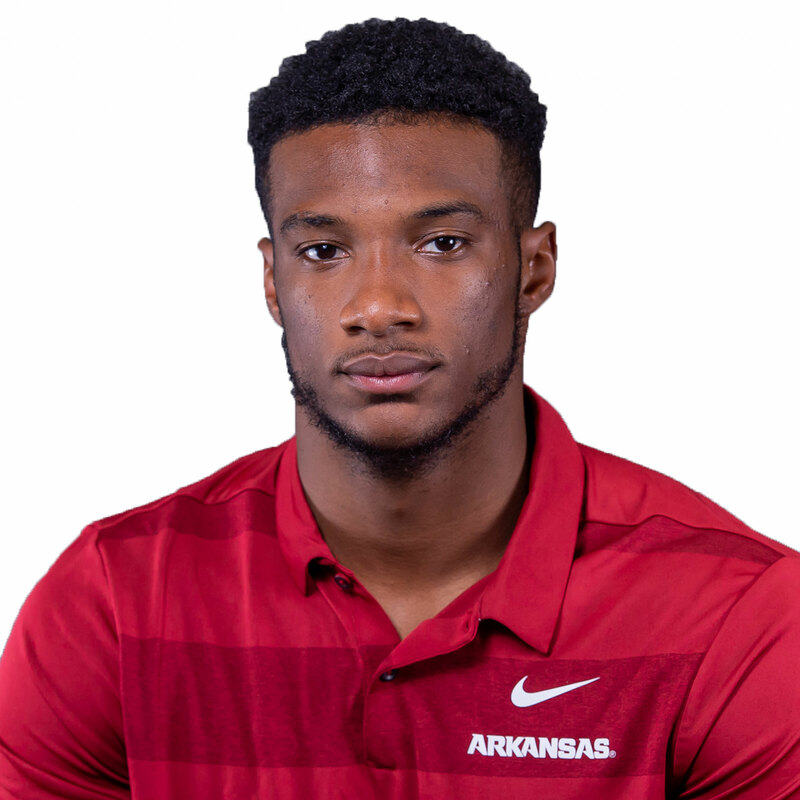 2018 (SOPHOMORE):Played in all 12 games for the Razorbacks as a sophomore in 2018 … Totaled 278 snaps over the course of the year, according to Pro Football Focus, primarily out wide, getting 229 plays from that spot on the field … Caught 17 passes for 191 yards and one touchdown, averaging 11.2 yards per reception … Also had one rush for nine yards … Put together his best performance of the season in the first game of the year, hauling in five catches for 132 yards and a score against Eastern Illinois … His longest of the day came near the end of the second quarter on a 57-yard pass from Ty Storey to complete a one-play drive and increase the score to 38-6 … Brought in a 46-yard catch a few drives earlier in the game to set up Arkansas’ third score of the day … It was the only 100-yard receiving game of the season for the Razorbacks, extending Arkansas’ streak of 12 consecutive years with at least one player to cross the 100-yard receiving threshold in a contest … Caught a pass in each of the first games of the year, the second-longest streak by a Razorback to begin the 2018 campaign … Later put together a stretch of four-straight games with a reception from weeks eight-through-12 … Turned in a receiving grade of 90.0 from PFF in the game against EIU, finishing with a 91.9 overall offensively in the contest … Helped the Arkansas offense to 4,028 yards of total offense and 28 touchdowns, with 2,307 yards and 17 scores coming through the air. 2017 (REDSHIRT FRESHMAN): Started 6 of 12 games played … Third on the team in receiving (401), tied for third in receptions (21) and tied for second in touchdown receptions (2) … Led the team in yards per reception (19.1) … Longest catch was 65 yards … Rushed eight times for 88 yards … Longest rush was 30 yards … Recorded one 100-yard receiving game … Recorded 13 catches for 226 yards and two touchdowns over a four-game stretch from Sept. 30 against New Mexico State through Oct. 21 against No. 21 Auburn … Third on the team in first-down catches (14) … Second on the team in 15+ yard catches (13) … Second on the team in 25+ yard catches (4) … Of his eight receptions on third down, seven resulted in a first down and five went for 15+ yards … 19 of his last 27 touches resulted in either a first down or a touchdown … Closed the season with at least one catch in 10 games, including each of the last four … vs. Texas A&M (Sept. 23): Turned a pair of jet sweeps into 50 rushing yards … vs. New Mexico State (Sept. 30): Caught four passes for 84 yards … Had receptions of 16, 21 and 32 yards in the first half … at South Carolina (Oct. 7): Followed up with three receptions for 37 yards and his first career touchdown grab … at No. 1 Alabama (Oct. 14): Made four catches for 72 yards and a touchdown … vs. Missouri (Nov. 24): Brought in his first two targets for 122 yards, including a 57-yard touchdown, in the first quarter … His other reception was a 65-yard gain, Arkansas’ longest reception of the year … His 122 yards receiving were the most by an Arkansas player on the season and the most by a Razorback since Jared Cornelius had 146 vs. Alabama on Oct. 8, 2016 … Became the only Arkansas player with multiple catches of 50+ yards on the year, the first Razorback to accomplish that feat since Keon Hatcher and Rawleigh Williams III each had a pair of 50+ yard catches in 2016. 2016 (FRESHMAN): Redshirted during initial year with the program. HIGH SCHOOL: Four-star recruit by ESPN … Consensus national top 100 wide receiver ranking by ESPN, Rivals, Scout and 247Sports, with a best of No. 63 by ESPN … No. 4 overall ranking in the state of Arkansas by 247 Sports and No. 5 by ESPN and Rivals … Named to the 2015 All-Arkansas Preps first team as a wide receiver … Chosen as Hawgs247 Class of 2016 All-State wide receiver … As a senior, had 36 receptions for 721 yards and 11 touchdowns … Saw time at quarterback in the Wildcat offense, completing 8 of 16 passes for 149 yards and one touchdown, while rushing 21 times for 150 yards and one touchdown … Also had 19 tackles and four interceptions as a defensive back in his senior season … As a junior, had 31 receptions for 779 yards and nine touchdowns … As a sophomore, had 25 receptions for 687 yards and 10 touchdowns … Caught four passes for 137 yards and one touchdown in the 2014 3A Arkansas State Championship game … Coached by Brian Strickland at Smackover High School … Chose Arkansas over Tulsa. PERSONAL: Born on Jan. 20, 1998 … Son of Adrian Jones and Cashonna Moore … Communication major.